“There comes a day when you realize turning the page is the best feeling in the world, because you realize there is so much more to the book than the page you were stuck on”. Sure we all get stuck. Because of a lot of reasons, a lot of experiences that life keeps giving us. Sometimes it all gets so bad that we would just want to give up, on life. You might be asking yourself “what if this is as good as it gets?” But that’s the beauty of life. Just when you are sure that this may be it, life throws a curve ball at you. This is the decider. Whether you want to swing the bat or take the long walk back to the bench. That’s completely up to YOU! When you decide to swing that bat, that when you realize that there’s a lot more to this life than the very little that we know of it or what we think we know of it. We all believe that our life has to move in a certain direction. And because we believe we have given it our best, things will only get better with time. But little are we aware that life is under no obligation to give us what we expect. Six years ago, I don’t suppose I would have ever thought I’d be doing what I am doing as of now. I was on some kind of a mission. To prove myself. Not just to the world but also to myself. Things hadn’t really turned up the way I had wanted them to. Things were not really hunky dory. So I was pushing myself. To do a lot better and reach the level that many of my counterparts had already reached, with angst. And just when I thought things were finally falling in place for me, my accident happened. It’s funny how some of us get to learn life’s lessons in the not so conventional methods. But believe me when I say this, when we learn it this way, the lessons learnt stay, forever. Sure things have not been easy. Sure it feels awful that you are not in a position to contend in the earlier race, forget about winning. Sure it is all unsettling to chalk a future path for yourself considering the dependency that is there on others. But is there really something that can be done about what has already happened? I don’t suppose so. What has to happen will happen. Whether or not we like it, whether or not we are prepared for it. What we can do is let bygones be bygones. And come to terms with reality. The sooner we do it the better it is. For everyone. Instead of sitting and brooding about what has happened in life, all that we have lost, we might as well sit up and look forward to what life has given us and what it has in store. The wondrous unpredictability of life need not always be something negative. We just need to stop looking at the closed doors and try to look for the open windows and look out for life has to offer. And try to capitalize on the opportunities that life may throw at you. You might even get something your way that you perhaps hadn’t even thought of earlier. And if you were to give it some serious time and your sincere efforts, you can see that that is what will help you unfold. That is what will keep you going. And you got to. Keep going. Keep looking at how you can get better, how you can channelize what life has bestowed upon you. Life doesn’t always give second opportunities. But if you have been lucky enough, then make the most out of it. Things might not be as I had expected. But hey, things could have been worse. So I am just happy that I have been given this second life. To live. To explore my many interests. And be thankful for all the lovely people in my life without whom I don’t suppose I would have even survived the ordeal. Our pillars of strength will always be there. It’s up to us how we draw strength from them. So go ahead my friends. Turn the page and enjoy all that lies ahead. Every story might have an ending, but in life, every ending has a new beginning!! The biggest uncertainty was about what the future would bring. That fate had, at her side, just randomly thrown. As to how to handle, her life’s new born malaise. For she knew that it wasn’t just a phase, it was to be lifelong. Or if she had to be hopeful, and wait for her life’s pendulum to swing. Was it because, they thought she deserved it and was strong enough to live ? 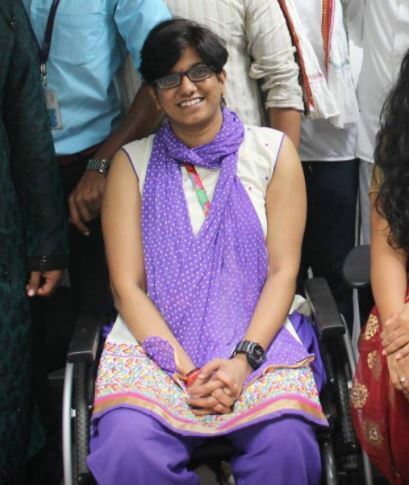 Sravani Ramachandran is a paraplegic from Bangalore, India and works at IBM India. 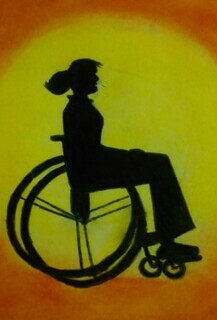 This entry was posted in Guest Posts and tagged spinal cord injury india, Sravani Ramachandran on December 7, 2017 by Tiffiny.